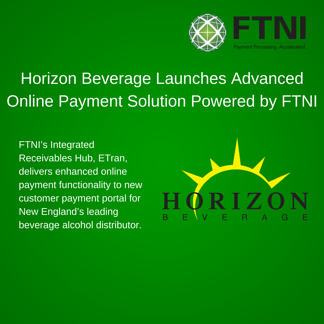 FTNI’s Integrated Receivables Hub, ETran, delivers enhanced online payment functionality to new customer payment portal for New England’s leading beverage alcohol distributor. 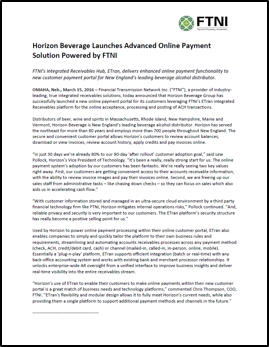 OMAHA, Neb., March 15, 2016 – Financial Transmission Network Inc. (“FTNI”), a provider of industry-leading, true integrated receivables solutions, today announced that Horizon Beverage Group has successfully launched a new online payment portal for its customers leveraging FTNI’s ETran Integrated Receivables platform for the online acceptance, processing and posting of ACH transactions. Distributors of beer, wine and spirits in Massachusetts, Rhode Island, New Hampshire, Maine and Vermont, Horizon Beverage is New England’s leading beverage alcohol distributor. Horizon has served the northeast for more than 80 years and employs more than 700 people throughout New England. The secure and convenient customer portal allows Horizon’s customers to review account balances, download or view invoices, review account history, apply credits and pay invoices online. Used by Horizon to power online payment processing within their online customer portal, ETran also enables companies to simply and quickly tailor the platform to their own business rules and requirements, streamlining and automating accounts receivables processes across any payment method (check, ACH, credit/debit card, cash) or channel (mailed-in, called-in, in-person, online, mobile). Essentially a ‘plug-n-play’ platform, ETran supports efficient integration (batch or real-time) with any back-office accounting system and works with existing bank and merchant processor relationships. It unlocks enterprise-wide AR oversight from a unified interface to improve business insights and deliver real-time visibility into the entire receivables stream. Financial Transmission Network, Inc. (FTNI) accelerates the way businesses accept, process, post and manage payments. Processing millions of transactions monthly, FTNI’s integrated receivables hub, ETran, accepts any payment method, via any payment channel — on a single, secure, cloud-based platform. ETran’s easy-to-deploy, modular design seamlessly integrates current business processes, bank and processor relationships, and back-office accounting software to deliver increased efficiencies and cost savings as a result of true straight through processing. Founded in 2007, FTNI serves more than 18,000 corporate users from leading organizations such as the American Red Cross, Benchmark Senior Living, DirectBuy, Five Star Senior Living, Mutual of Omaha, Penn Mutual, Physicians Mutual Insurance, Proxibid, RealPage, Shamrock Foods, The McClatchy Company and many more. For more information, visit www.ftni.com.